I’m off today! Anyone else? We get today and next Monday off — one each for George and Abe. But I had to get up early today . . .
Because of this little girl . . . I couldn’t take it anymore. I was too sad and the hubby was too sad. We put our name in to a couple of rescue places and were approved for a little girl puppy. Even though we wanted a boy. But we rearranged our thoughts and the next thing we knew, we wanted this girl. Badly. We went shopping and bought a bunch of stuff . . . only to be told (the day before we were supposed to bring her home) that there was a mix-up, and the director had given her to a different family. My eyes might have leaked just a little bit over a puppy I had never met. Just a tad. And then . . . another rescue called us and said they had some puppies at a foster house and did we want to take a look . . .
I’m sure the hubs can fix the big gaping Kristin-sized-hole-in-the-front-door sooner or later. We drove far and wide and then after a few hours of stepping in pee and being chewed on by ELEVEN puppies, we picked her. We thought for sure we would get a boy. I was kind of counting on it. I don’t know why. Just because. Maybe because Foster was just so cool. And Sydney was . . . well, you all know how Sydney was! So I pictured us getting a boy. And I only had a boy name picked out. For, like, YEARS, I’ve had this name picked out. So the twin helped me with a little twist on the spelling and we’re keeping the boy name even though she’s a girl. Even though soooooo many people have had opinions about it that it’s not even funny. Even the girls at the vet gave us grief. Now I get why some couples choose to keep their baby’s name a secret until it’s too late and the name is permanently on the birth certificate so even if you don’t like it, there’s nothing you can do but call the baby a nickname behind the parents’ backs. She’s our Murphie girl. And we love her. And she knows her name! She does! So back off already! And, just to be sure no one confuses her for a boy, we pinked her out. 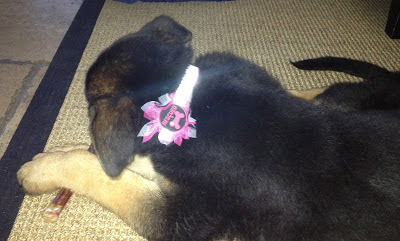 Her collar is pink, too, but it’s reflective so there’s a glare. I think. I don’t know. Could be that I’m not a professional photographer. Just a nerd who puts flowers on her dog. And I’m married to a man who picked out the flower. Plus he picked out a pink heart charm with fake diamonds to hang from the collar. It doesn’t bother me in the least that I can’t remember the last time my hubby gave me flowers or bought me fake diamonds. Uh uh. Nope. Our little 11 week old Murphie girl has really helped us with our sadness. And if you’d like to change her name because you don’t like it, you are welcome to come over at three in the morning when she needs to be let out of the crate for a potty break, and we can discuss it then. Deal? P.S. We have a baby gate set up in the family room so Murphie is only in one part of the house. I left her alone to use the bathroom and when I came out, she was waiting for me on the other side of the bathroom door. I can barely get my legs over that baby gate and apparently, she can jump it already. OH MY GOODNESS! She is absolutely adorable 🙂 And honestly, I love the name! I think it is super cute and the spelling does make it girly. I'm so excited for you Kristin! I can just picture you running through the door with excitement. Murphie is very adorable! I like the name! I love the boy turned girl twist on names and they are very popular now anyway. I can't wait to hear more about your adventures together! Congrats! Precious !! I am still at school and after a crazy day, that made me smile….LOVE the name and pink accessories ! The visual of you and the baby gate made my day 🙂 Enjoy the new bundle of joy, so , so sweet. Oh so sweet. We had to put our shepherd down 5 years ago this month. Last week hubby Was finally ready but only for a cat! I love the boyish name!! My little sister's name is Logan and so I am totally ok with the confusion. She is too cute and I am glad that she is helping to fill the lonely spot that you had. You will make all sorts of new memories with your new baby! I follow your blog as a teacher…but, I'm a puppy raiser for an Assistance Dog organization. You can follow my blog at http://www.smithpuppy.blogspot.com. 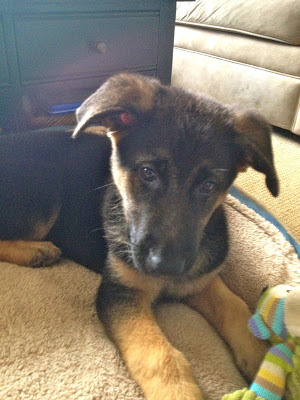 Anyway, they name our puppies for us…so imagine the looks that some of the raisers get when they tell their dog's name. We can just blame it on the agency. 🙂 My puppy's name is Ventura (she's from the beaches litter.) So, at least it's not too bad, it could be much worse. But, let me tell you the anxiety at puppy hand-out waiting to hear who I would get. Have fun with Murphie! 🙂 She is adorable! I think it is an adorable girls name!!!! She's gorgeous and you absolutely did the right thing! I currently have two dogs but would keep rescuing if the hubs would let me… 🙂 Congratulations! She looks like a lover. Congrats on your newest family member. She is very lucky to have you for a mommy! Aw, Murphie is so cute! I really want a puppy! I love the name Murphie! Who cares if it could be a boy dog's name too? My family got grief for the same reason when we named our female dog Dusty. I always had to explain why we chose it. Congrats on your adorable puppy with an adorable name! Aww! Hi Murphie! What a sweet girl…and so lucky to find a fabulous family. 🙂 I'm happy for you! Congrats on the new puppie! I love her name! I don't think it is a boys name. Brings to mind the TV show Murphy Brown and she was a girl. Don't really remember the concept, just the name of the show. When I told my Father-in-Law the name we were naming our daughter, the first words out of his mouth were that is a boys name. Her name is Addison and it is spelled the boys way, because she is named after the street Wrigley Field is on. So I didn't feel right to change the spelling to the girls way. I have a parent who changed the spelling, but she named her girl Addison too, because she loved the name. So you might be a trend setter and people will be naming their female dogs Murphie!! Congrats again! Enjoy your new family member!!! Murphie is precious. I love her name. Rescue dogs are so special. Our sweet little Coco is a rescue dog and we adore her too. I LOVE the name Murphie! She is adorable. I am so happy for you! I love having a dog and can't imagine not having one. She is absolutely precious! I love the name, too! I am very happy for you… Congratulations! Congratulations on your sweet puppy! Thanks for sharing her adorable picture. So adorable! I love the name! I love her…. she is sooo sweet. Enjoy!!!!!!!!! Congrats! She is adorable and very lucky to be a part of your family. Best of luck with the training and "wake up calls/cries/barks/howls" at all times of the night. 🙂 Enjoy her and take lots of pictures, they grow up so quickly. Hurrah! Yeah! Hip,hip hooray! I am so happy for you!!! I love Murphie's eyes! Actually, I love all of her! Love the name – it is HER name!! One of my favorite students was a girl named Murphy! Congrats! Such a stinkin' cute pup! I think Murphy is a great name! My shih-tzu Poppy can leap over a 4 foot gate. Our 5 pound shih-tzu daisy chewed her way out of three airline carriers and must be crated in a pit bull locking carrier when we travel. All of this to say that, "Where there is a will, there is a way." Little Miss Murphie just wanted to be with her mommy. I'm not just saying this to reassure you….I think Murphie is an adorable name! An adorable name for an adorable puppy! I love love love doggies!! As I was reading your post I was so anxious to hear the name you picked out and when I read it I said "but that is a girls name"! Remember Murphy Brown She is precious. 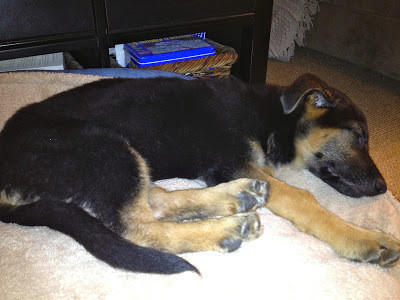 I have a cute picture of my baby boy puppy on my blog – he is my blog helper. Always at my side – as a matter of a fact he is by my side right now – what can I say, he loves to blog! Congratulations on your new baby! What a cute pup! Congratulations! I love the name btw. Enjoy her! I'm so excited you got another puppy. She's adorable. My dog is also female and named Murphy so I totally understand the grief you get about her name! She's beautiful! Super cute! Can't wait to read all about her in the coming months (and she how big she turns out to be)! She is adorable!! And I love her name! We named our sweet fur baby Charley and she is quite typically called male, but we love her anyway. Awwww. There's nothing like puppy love! Congratulations!now the fun part of potty training, chewing all your shoes, and late night cold walks. But like I said, there's nothing like it. Aww congrats! She is just the cutest & I love her name!!! I'm sending her cyber pats!! Yay! So happy for you! Murphie is!! I LOVE her name!!!! So happy for you two! We used to have a German Shepherd growing up named Hobo. He went to the farm after he chased our neighbor up into a tree & he had to stay up there for 4 hours & then bit him. Your new puppy is ADORBS!! So happy you got a new puppy to love and Murphie is THE perfect name!! Now you need to get her lots of cute outfits to wear that are pink and frilly! I am sooooo happy for you!!!! My dog as a kid was a girl named…. Charlie Brown 🙂 Loved her for 14 years. I was at 4H Dog Masters with my daughter tonight. Lots of puppy love to you and Murphie! I'm utterly in LOVE with Murphie – and it is an adorable name! Congrats Kristin! I'm so happy for you. I love the name Murphie, she looks just like a Murphie to me. So glad you have a four legged friend again. YEA, I am so happy for you!!!!! I had the same problem when I told people I wanted to name my son Casey. She looks adorable and you sound very happy. Congrats! Love, love, love, love! And I love her name too! She is perfect, with a perfect name! I am so happy for you! I felt your sadness and now I feel your joy. There is one LUCKY puppy! Mazel Tov on the recent addition to your family! She is absolutely adorable! I hope she adds joy and happiness to each of your days! She is beautiful! And I love the name! Cute puppy! We have an 18-year-old female cat named Murphy. She was a stray kitten in our apartment complex, so we took her in, but couldn't decide for days what to name her. We were watching tv one night and a commercial came on for Murphy Brown. My husband said, "Murphy! We'll name her Murphy." So we did. It fits her perfectly, and no one has ever had a problem with it. I hope your Murphie brings you as much joy as our Murphy has. I'm so happy for you! Murphie is a great name. I have a former student named Murphy. She's half a twin set and she's full of funky personality. We bought two puppies at one time because I have twins and we always did things in pairs… anyway, our dogs are both girls, my daughter chose a very "girly" name Smore's and my son… well hes a baseball player and everything he thought of Fetch, Homerun, etc sounded like a boys name… he finally decided on Scout. Everyone told us it was a boys name… helloooooo "to Kill A Mockingbird anyone??? Congratulations! So happy for y'all and she is beautiful. I love the name and know she will be perfect and bring you so much happiness! Thanks for sharing! I named my dog Ziva, after the character on NCIS and the only people to get it right away without giving me the "LOOK" were my 12 year old niece and the vet. Both are fans of the show. I love my little Ziva Diva. Our next dog will be a German Shepard as they are my first love, grew up with Shepards. They are so smart and just love them. Sounds interesting. Looks like you are a specialist on this because you just made it so easy to be with you, motivated me to learn more on the subject! We had a cat named Murphy for the first 19 years of my life. She was the best cat ever-I'm convinced it was the awesome girl name!